The monetization issue has hovered over the heads of Asian messaging services like Naver’s Line and Tencent’s WeChat lately, but the recent smash hit “Line Pop” matching game offers one example on how to cash in on those massive user bases. A new report from Distimo highlighted publisher Naver as one of the most successful app makers in Asia. 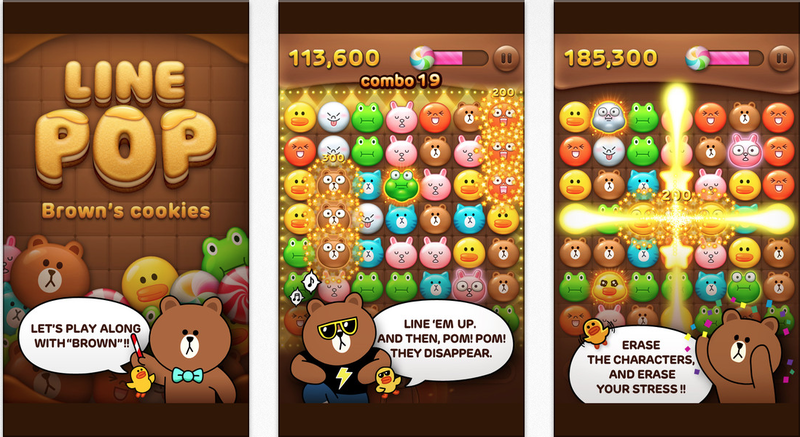 It tore up the charts with five separate apps at the end of last month, including Line Pop, its fastest growing. The analytics firm estimates that the game managed to attract 1 million downloads in just one day and a total of 1.75 million in its first three days. The app is also believed to have brought in $1 million in revenue in the first 12 days. By comparison, OMGPOP’s Draw Something, the viral sensation that swept the west earlier this year took an estimated 9 days to hit 1 million downloads. Facebook took nine months, and AOL took a shocking nine years. Of course, these are different times we live in, but the rapid success of Line Pop still goes to show how well Line is leveraging its massive user base. With the use of a virtual currency for purchasing stickers and coupons, Line has already had some success with monetization, but expanding into a gaming platform would take things to the next level. Line Pop itself doesn’t look that unique. It’s a matching game in the same vein as Candy Crush and Bejeweled. However, the game uses cartoon characters from the Line service and allows players to compete with or get help from their friends on Line. Line boasts more than 80 million users around the world. It’s popular predominantly in Asian countries. The company recently revealed that it has 10 million users in Thailand. Line entered China last week and should be due for a significant spike in new users from its efforts in the market, though it will be the clear underdog as it goes up against WeChat, which has almost 300 million users. For its part, Tencent already has a successful gaming business built off the strength of its QQ instant messenger, and WeChat integration is an inevitability at this point. This holiday season, Line will also face tougher competition from Whatsapp, which is offering its iPhone app for free for a limited time. The messaging space also continues to get cramped as Japanese giants GREE and DeNA have released their own chat apps to attract users to their social gaming platforms. As Line breaks into gaming, these two will serve as formidable foes. As messaging services continue to build out their platforms and expand to games, they could even take a chip out of the behemoth itself – Facebook. We’ve been saying for months now that mobile messaging services are encroaching on Facebook’s territory, and the latest numbers for Line Pop definitely show that Asian services are capable of building their own momentum and monetization on their own. For more insights into how 2012 played out on the app stores around the world, head over to Distimo’s site to download the full report.